My love affair with this series began way back when Flat-Out Love was first released and was the start to my addiction to all books Jessica Park. Jessica has proven she can write the wit and the serious (see Left Drowning) and this book is a perfect balance of both. My affinity to Celeste has always been strong, like her I was the nerdy school girl, the loner and I never fitted in. While I like to think in the long run it never did me any harm, I couldn’t help but relate to Celeste’s plight both in Flat-Out Love and now Flat-Out Celeste. Throughout Flat-Out Love I was her biggest cheerleader so when Jessica revealed that Celeste was getting her own book I couldn’t wait to get stuck in. I knew I would love it, if ever a character deserved their own book it was her and I was rooting for a HEA for our troubled school girl. 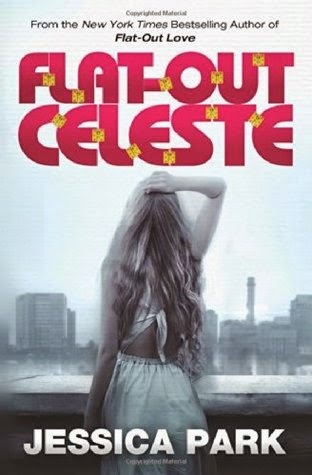 In Flat-Out Love, Celeste was at junior school, in Flat-Out Celeste we start with her completing her final year of high school and yes she is facing her biggest challenge yet… what university to go to. Yes the little girl has grown up, still super intelligent, super nerdy but trying her hardest to try and change and to make friends, she wants to begin her University life as the “new and improved” Celeste. Although in my opinion, she needn’t have changed, she was perfect just the way she was. Even though our Celeste was emotionally stunted and was still gravely lacking in social skills, throughout this book you were witnessing her slow realisation of her want to change, her need to change and then you watch her take the bull by the horns and try to change. No mean feat for a little girl that only really ever interacted with her brother Matt, his then time girlfriend Julie and to a small degree her parents and also our beloved Flat Finn. Celeste could have the pick of any University she wanted, being wise beyond her years and a grade A student, all the top Universities were vying for her to pick them. Imagine her surprise when out of the blue she receives an email from another University she hadn’t even approached. The email was from Justin Milano their liaison officer, he was a sophomore. It soon became apparent that he was just as socially inept and awkward as she was. You could tell just from their first initial emails that he was her soul mate, the ying to the yang, the sun to the moon, they couldn’t have been more perfect for each other, but would either of them see that, would their social awkwardness rule or would they both be finally able to spread their wings and fly, could they do the impossible? I have to say that Jessica Park did Celeste proud with this book; I never would have thought I could have loved her any more than I already did. She was like my little sister, I wanted to nurture her, I wanted to smother her with cuddles and kisses and prove to her that she was beautiful, she was perfect just the way she was. She never needed to change, her character was infectious, her dry sense of humour and her mannerisms were all unique to her, they made Celeste the beautiful character that she was and I wanted more and more than more is what I got, I was deliriously happy. Justin was just totally adorable, awkward, clumsy and so romantic. He shared the same level of humour as Celeste, the same intellectual aptitude, similar quirks and they were so perfect for each other. Right from the very start, their very first email exchanges I knew that he was the one for her, they were just sooooooo cute, I was championing them from the start, but as you know, nothing ever runs smooth and these two are going to need to face some challenges full on. They need to push their boundaries and their comfort zones and I was with them all the way, pushing and pushing and pushing. Matt and Julie also star in this book and it was great to catch up with these two, I just don’t want this series to end, I love it too hard. Once again Jessica has pulled me in with her unique story telling abilities, the quirk, the humour, the wit and the way she brings the characters to life. No longer are they characters on a page, but they are real life people to me, while reading I became totally submersed in their story, I was there with him, I lived it, I breathed it and I devoured it. This is a story about finding your way in life, learning to live it for what and who you are, live it your way, stamp your imprint and make it count, don’t change for no-one, you are what you are, quirks and all, there is someone in life for all of us, it just may take a leap of faith to find them, grab them with both hands and don’t let go, make the most of what you have been given and just be happy. This is a series that will stay with me for a long time and one that I will never forget. So if you haven’t jump on board the crazy Flat-Out Love train, give it a try, it is YA at its best, it will have you laughing, it will have you crying, but most of all it will have you feeling and loving, it is a joy to read and one that I will read again and again and again. Once again, awesome job Jessica Park, I seriously want more from this crazy family, please I am begging you, write MORE!! !